No matter what season it is or whether there’s a holiday coming up, as a freelance writer, you want to make sure that when you step away from the computer, you’ll still have a presence online. Well, for starters, you don’t want people to all of a sudden forget about you. Do you want to be the freelance writer who takes the entire summer off without touching their laptop, updating a social media profile, writing a blog post or connecting with their email subscribers? I hope not. Because if you are, then making a living writing is going to be tough for you. You’re going to have hustle hard, pitch constantly and work your little tail off to find work once you get back from vacation or finally get your motivation back. But, you know what? There are some easy ways to make your presence felt online every day – whether you’re taking the weekend off to go camping or you’re super swamped with a huge project that leaves you with no time to be online. And no, I’m not going to tell you that you have to guest post or develop a pitching process or even solidify your brand to stay current and on the radar of prospects. No. the best way to have the illusion of always being online is to have an effective marketing strategy. For a lot of us, marketing is an icky word. I mean, we’re writers, not sales people. Well, my friend, I’m sorry to tell you, but if you truly want to be a successful freelance writer – you know the one that can work wherever they want, with whomever they want and whenever they want – you’re going to have to make marketing your new BFF. When I think of marketing my services, I sort of think it’s my way of connecting with others. It’s like I have a business card and whenever I “see” someone online, I “hand” them my business card. We connect and over time we nurture a relationship. So, even if you pooh-pooh marketing and think it’s not for you, there are some easy – and smart – ways to market your freelance writing biz. Some of these marketing strategies may take more time than others, while some of these might mean you have to step out of your comfort zone to see any results. I created a video about these tips if you like watching instead of reading! And I would LOVE it if you subscribed to my YouTube channel! One thing’s for sure – when you’re a freelance writer you’re going to be doing a lot of emailing. I get almost 100 emails a day during the week. Not all of them are inquiries, but many of them can be potential leads for writing work or to take my course. The online world is big and vast so you want to “inhabit” as much of it as you can online. And for freelance writers, this means having different places to house your portfolio. If you’re not sure what I mean, a portfolio showcases your work as a writer. Typically, it’s the best pieces you want to show and it’s pieces in your niche. There are many different places to have a portfolio, like on your website, on your LinkedIn profile or on a portfolio site like Contently. I say, use all of them! For the longest time I only had my portfolio on my website, but once I started my LinkedIn profile I slowly started updating my resume with all my new client work. I recently also started housing my portfolio on Contently. What’s nice about Contently is that once you upload your samples (you can even upload PDFs) it tracks the social media shares giving prospects a bit of a metric on how engaging your writing is. One other place you can house your portfolio is on Pinterest. I recently removed mine since I’m currently sharing my Pinterest profile with two blogs, but a lot of freelance writers are now using Pinterest to market their services. 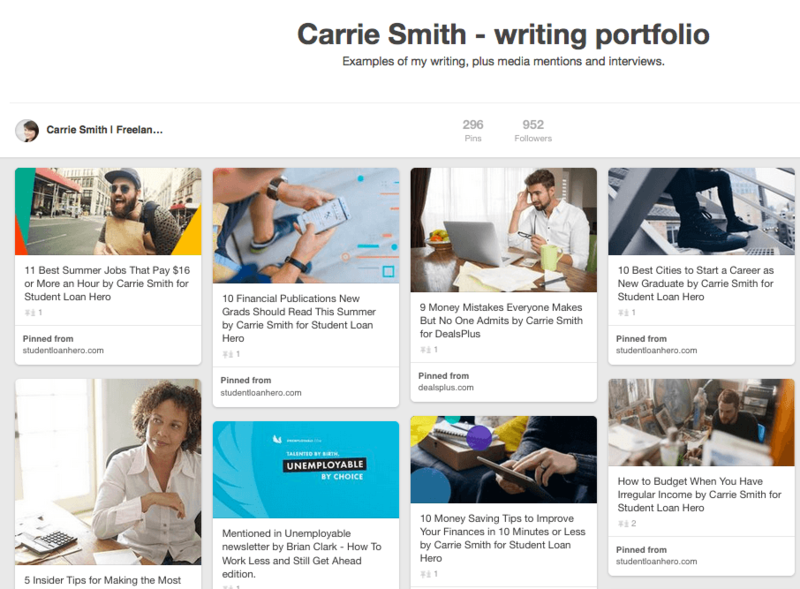 For example, here’s Carrie Smith’s (from Careful Cents) writing portfolio on Pinterest. The goal is to expose your work to as many different potential clients as possible. So using platforms like LinkedIn, Contently and Pinterest just helps you reach more people. I’ve been preaching this for ever now – especially to new freelance writers – but having your own blog is one of the best ways to stay current and in the eyes of potential clients. Oh, and it’s a great way to acquire business. Posting content in your niche shows prospects you know your stuff. For example, I have a blog, Twins Mommy, where I share tips to help moms make money. I get inquiries on this blog for freelance writing. 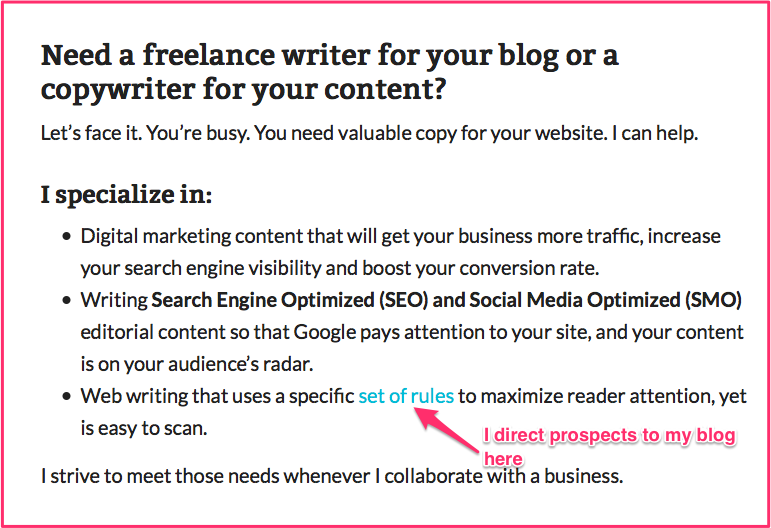 Or, you can use your freelance writing site to blog about topics you want to get paid to write. This is what a course participant, Heather, did on her freelance writing site. 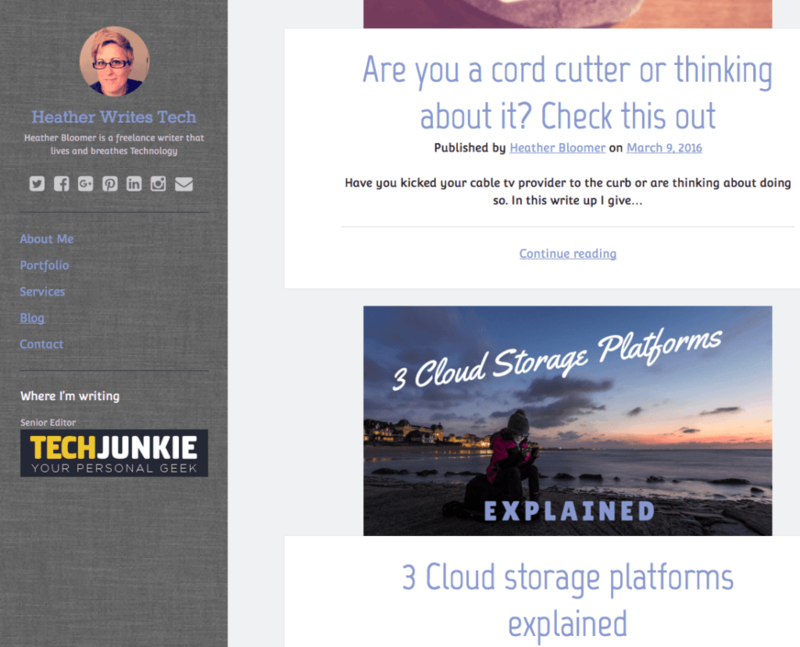 She’s a tech freelance writer and her blog shows her expert knowledge in this industry. 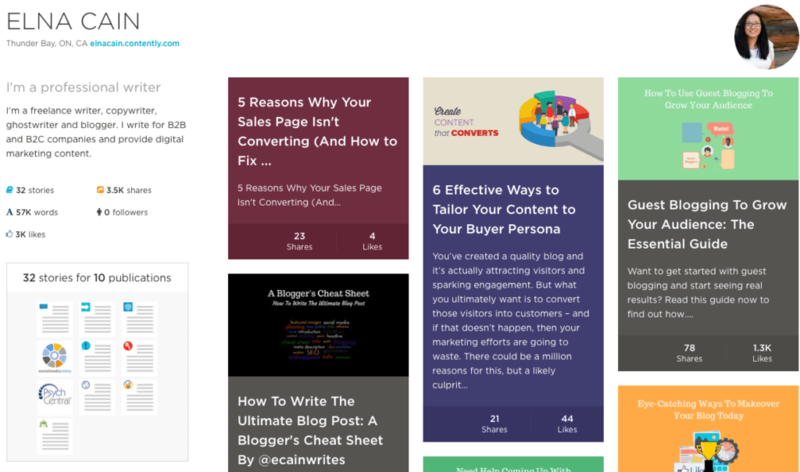 This is a built-in way to always have samples available in your niche. Or, you can go another route like what I did. I just started a blog about freelance writing and blogging. And while it’s not entirely in my digital marketing niche, it does show how engaging my writing is in terms of capturing visitors and converting them into subscribers (which is what a lot of my clients want my writing to do for them). So no matter what you really blog about, if it’s highly engaging, well-written, formatted correctly and you promote it strategically on social media, prospects will find you. If you need help setting up your blog for your business, check out my easy tech-free tutorial! It includes a video also! One neat trick I started doing early on was saying I was for hire in my author bio. This immediately tells potential clients that I’m available and it’s just a great marketing strategy when you’re guest posting. 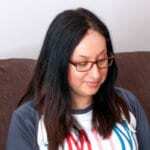 For example, here’s my author bio for my guest posts over on Tweak Your Biz. It’s not necessary for every author bio, but it’s best to place “for hire” on those guest posts that your target clients read. For many new freelance writers this can be a challenging thing to solidify. Once you choose your niche, there’s no law saying that you have to stay with that niche. Take the time to discover what you really like to write about and whether or not you can make a living from it. 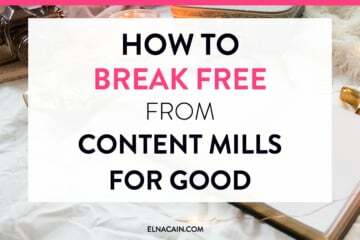 I started with parenting and natural health as my niches, but quickly learned I couldn’t really make a profit from writing in those industries. It wasn’t until later I started reading about how to market my services that I loved all things about digital marketing. So, once you find your groove and a niche that you love writing in, stay with it. Start to build your portfolio in that niche. I’m working on building my digital marketing niche portfolio. For the longest time I either was ghostwriting in this niche or providing content to sites that haven’t been created yet. It’s just recently that I picked up some awesome clients in email marketing and digital marketing. Now, I’m able to build my digital marketing portfolio and am finding that the inquiries that come my way are all in that niche. So, aside from building your authority in your niche, it’s a great marketing strategy since prospects who are looking for writers will quickly find you (based on your niche). In one of my recent posts I mentioned that a secret to being a well-paid freelance writer is not what you know, it’s WHO you know. And being “associated” with other certain freelance writers can help you land a gig. How do I know this? One of my course participants landed a writing gig over on Blogging Wizard (one of my clients). And she was able to do that because she took my course, which, for the client, meant I vouched for her – by proxy. One of the great things about social media is that you can connect with absolutely anyone, even if they are famous or an influencer. And it’s super easy to. You know how I do it? By commenting on their blogs. 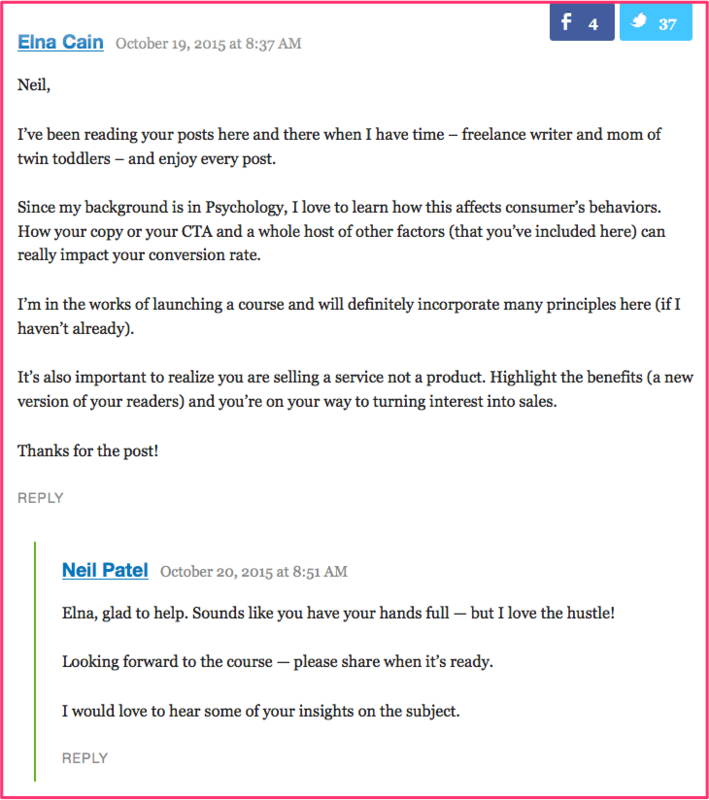 Here’s my comment on QuickSprout – one of Neil Patel’s blogs and his response. Then this lead to my reaching out to him on LinkedIn where we messaged each other and eventually I asked him if he would want to contribute to an upcoming Huffington Post of mine. So, go ahead and follow influencers in your industry or the blogging industry in general, comment on their blog posts and connect with them! Another thing you can do to market your freelance writing biz is just to “pin” it on Twitter or Facebook. This means it stays at the top of your feed so that more people won’t miss this important information. @MaraniMichael Thanks for that testimonial! Social proof is a big indicator that other people like your services and writing. This can help prospects realize quicker that you would be a good fit for their business. Go to blogs you admire or want to write for and start commenting on their posts. Most blog owners read their comments and will respond to them. This is how I landed my gig over on Blogging Wizard. I left a no-fluff comment and Adam responded back to me. We made a connection. From there I probably shared his content and he took a look at my site and my blog. From there he contacted me and he ended up hiring me. Finally, one way to market your biz is to just let another freelance writer know you have a spot open on your content schedule. A lot of established freelance writers often have more work than they can handle. And we are always open to handing work off to other writers who ask. By telling others you need work, work will eventually find its way to you. It’s happened to me numerous times and it will happen to you. Being a freelance writer is more than knowing how to write. It’s being a savvy marketer. But, you don’t have to have years of sales experience to promote your services. You just need to know how to do it the smart way. These ten ways will totally help you get the word out that you are a freelance writer looking for work. Over to you – which marketing strategy are you going to try out first? If you’re ready to really earn a living from writing, you can get your step-by-step profitable freelance writing blueprint by joining Write Your Way to Your First $1k. It walks you through the exact action steps you need to take to land clients, tweak your website to increase conversions and get paid to write. Thank you for your bravery and sharing your expertise. 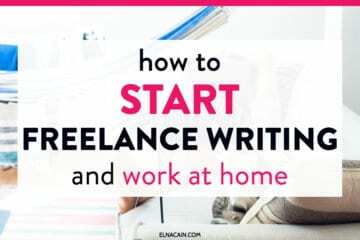 Thanks for this post Elna…just starting out on my own freelance writing career and your tips have got things underway. I’ve also downloaded your free guide to accelerating your freelance writing income and can’t wait to read it. Hopefully, I’m already on the right track. Thanks so much! I hope you enjoy the guide and grow your income! Thank you for this! I am a web designer who specializes in SEO, but I also keep up with two of my own blogs, meaning I am writing a lot. I figured that incorporating an SEO content writing service would be a perfect additional service for my market. Now I’m in the boat of trying to figure out how to market myself. I feel like I’m starting from scratch! Your post gave me so much helpful info and a place to start. One thing I overlooked was writing for authority sites (like Blogging Wizard). I had always assumed those sites were unpaid work. I’ll definitely be expanding my scope and looking into sites like that as well! That’s a fantastic idea! 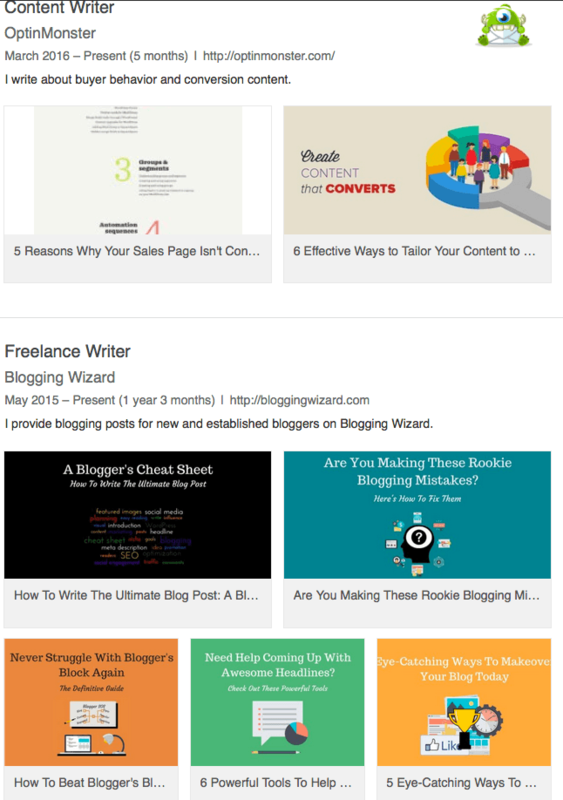 Blogging Wizard is a client of mine. You can guest post on his site though (not anymore!) and that’s unpaid. Good luck! Of course I will mention you! You are one of the best bloggers there is! Love your blog and what you are doing to help others with your new book, From Nope to Hope! Such simple, yet effective ways to get more gigs and market your freelance writing biz! I’m just now breaking into the world of ‘real’ freelance writing, and I absorb any morsel of information like a sponge. I hope to specialize in Digital Marketing also, but have literally hundreds of other interests (sigh). Nailing down a niche is tough, but I’ll take your advice and start posting blogs that relate to what I want to write about for a living. Thanks so much for posting, even if I’m a little late to the game on this one! That’s good! Keep to one to three niches and write in those topics. You will find which topic you like more and you’ll find out which topic has more jobs! Hi Elna, Another great post from you, informative and well put together. I always read your posts, and I am taking your course “Write your way to your first 1K”. I love it and it is certainly helping me to come out of myself, but I am still pretty scared and every time some one reaches out to me I freeze. I need to get over this quickly or I will never earn anything. Thank you for your great inspirational posts. So happy you are in the course! I know you can do it. You’ve started so that’s the first step. Now comes the hustling, negotiating and writing! Then you get paid. I hope you joined the pitching challenge? Good luck. Once again you’ve provided valuable information for freelance writers who are looking for ways to market their business. And the examples you gave will surely leave no doubt on how to use these suggestions to their advantage. Passing this along to share with others. You rock mama! Thanks a bunch. Marketing your services is key if you want to succeed! The above was an awesome tips and educated me a lot. I don’t even think about make text signature for my email, but now I have to. You know?… I’m thinking about updating my Linkedin profile and adding some portfolios link, however now working on build it. Sure, I’ve blog for long time, but I don’t have many great content. I knew blog post is great portfolio for me hence I working on improving quality, but it seem a hard working to me. Thanks so much for stopping by! That’s great you’re going to start using an email signature! It’s definitely a great way to brand your service! That’s great you’re going to use your blog for your portfolio. Tweak your posts and get it ready for your samples! Long time no see 🙂 How ya doing? Thanks so much. Happy to hear you are using these tips. These are some great tips — and it reminds me of the adage about important things being easy to do, but also easy not to do. For instance, pinning a promotional post to the top of our social profiles — simple, right? Fast. Easy. Yet so few people make use of this feature, even though it’s available on Facebook, Twitter, Google+ and others. You’re a definite rock star when it comes to marketing yourself online. Good job. Love that Neil responded to your comment, too. Very cool. Yeah marketing is a BIG thing if you want to make it online as a writer for the long haul. Great post as usual. I’ve taken notes of all the points and will be using them. Thanks so much! Glad you found some tips to help you up your freelance game. 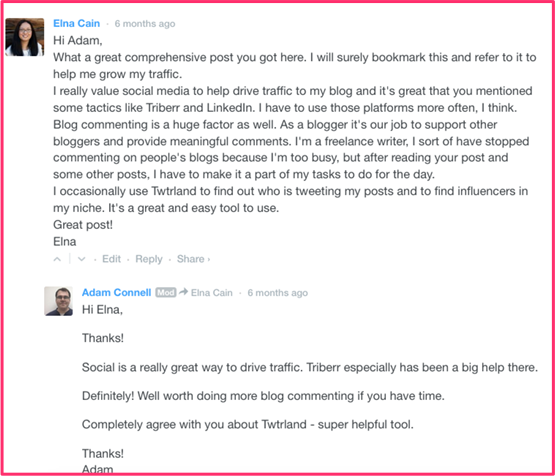 Being all over is a great tip and commenting with influencers is just awesome! I had a contently account since maybe late 2014 but hadn’t actually done anything on that. Your portfolio there looks awesome and I am eager to set myself one. I too have a blog for my niche clients, social media and content marketing. That works because my content gets seen on the search engines by clients. This has earned me a secure living off writing. Thanks so much!That’s great you have a Contently profile. Now you can start using it! I love how you always take a complicated subject and explain it so clearly that there’s no excuse for us to not have a successful freelancing business. This is such a great post. And thanks so much for the shout out! 🙂 I couldn’t have done that without your help through the Writeto1k course and from the support of your FB group. 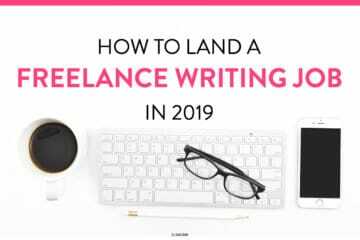 You’re a great freelance writer and that’s why I featured you twice in this post 🙂 Thanks again for your support and for enrolling in my course. I know it’s paying off for you big time! I immediately updated my Contently portfolio, deleting my old site, changed my physical address etc. can’t believe I forgot to do all that, your post was a needed reminder. Wow! That’s great. I’m sure you’ll be turning down leads for sure! Excellent stuff Elna. Thanks a bunch. I will incorporate all of them in my marketing efforts too. Awesome girl! So glad to help you out in your freelance writing biz. Hey, Elna. Great post! That’s a new detail to add to a blogger bio. Really catchy! And I never knew I can ask other freelance writers for work. That’s a good thing to know. Thanks so much for sharing. Yeah, asking other writers for some clients is totally alright 🙂 Many writers may have more work than they can handle so handing it off to a fellow freelancer is always the first option. It’s good to know that I am already employing most of these tips. My area of improvement is putting myself out there with other writers and influencers. Just mustering up the courage to hold a convo is a bit intimidating since I still feel a bit green in the industry. Always enjoy your posts. Going to add to my Buffer queue! Good to know that you are employing most of these marketing tips. Way to go girl! Top quality and great tips Elna. I just realized that there are alot of things that i havent done and i need to be doing them.I am implementing them ASAP! Many thanks. That’s great! Thanks so much for coming over and leaving a comment. Glad I put a fire under you, ha 🙂 You’re ready to start marketing your business! Good luck. Great and informative post, Elna! I’ve pinned several times on social media and it’s never crossed my mind to pin about the services I offer. Smart move and one I will definitely utilize! Thank a lot. Yeah, Pinterest can be a gold mine for many freelance writers. I was surprised I landed a writing gig so fast! Good luck! It’s not often that I read a blog post and want to pop open another window on my laptop and start applying what I’m learning. You made that happen today. As a long time blogger and new freelance writer I’ve gotten a bit overwhelmed with all of the ways to start marketing. I’m going to stop right here and focus on your tips. Thanks! That’s amazing news! Thanks so much for that compliment 🙂 I’m glad you wanted to take action right away. It shows you mean business (as my 3-year-old daughter says). Great tell me how it all goes! I decided that I wanted to go with the camping industry as my niche. I find myself questioning that decision every other week because it is difficult to find work on sites like ProBlogger, Indeed, and others. How did you discover that your original niche wasn’t profitable? Your niche is pretty neat since not a lot of freelance writing are in that niche. So you might do best with cold and warm pitching approaches rather than looking at job boards. So guest posting and cold pitching would be your strategy. For me, there were a lot of job ads for parenting bloggers and the pay was stated. So something like $25 for a post. I saw many like that. I also knew that the parenting niche is over saturated. So I decided to find a different niche! Elna, great tips on marketing your freelance business. Each one is actionable. I would note in the email signature to avoid giving a home phone number. I’ve had a problem with this one. A business number is great though. Great post. Across the board, all of these tips are worth applying to help market your business. One of the first things I thought when I saw your e-mail signature was, “Right. I need to do that.” Haha. Thanks a bunch. Glad you found these tips helpful and that you’ll start doing some of them! Yes, an email signature is a great way to market your services!